Or view larger version. Notice for Civilian Exclusion Order No. 28. April 30, 1942. Unknown artist. Poster. Collection of Oakland Museum of California. Gift of Henry Madden. This is a notice for the Civilian Exclusion Order Number 28. 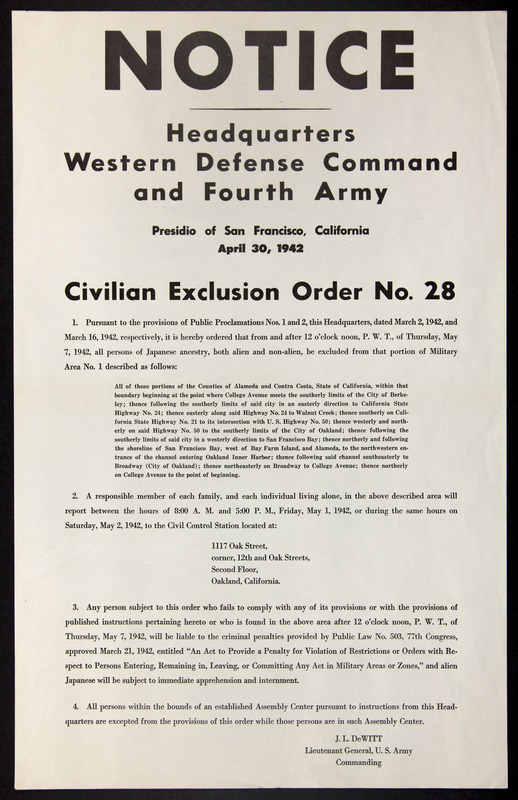 The Civilian Exclusion Order Number 28 was an explicit order instructing people of Japanese ancestry to register at a designated Civil Control Station which was located at the corner of Oak and 12th Streets in Oakland, California. The registration of people of Japanese ancestry was in preparation to relocate this segment of American society to internment camps during World War II.